Site conditions and the intended use of a concrete slab determine the slab's design & construction details. Whether it takes the form of a short walkway or the vast floor of a giant warehouse, a concrete slab is meant to provide safe, solid support day after day. But to deliver on this promise, a slab has to be built right from the start. Some contractors can meet slab construction requirements better than others. Bowman Masonry & Waterproofing is Greater Clearfield's experienced and trusted concrete slab contractor. Our customers choose us for our quality concrete slab construction and repair and top-notch customer service. Contact us today for a free estimate for concrete slab pouring and replacement in Saint Marys, Bellefonte, Altoona, State College, Du Bois and surrounding areas. What makes a good concrete slab? Smart slab design. Design details such slab thickness, reinforcement, formwork and finishing must be responsive to site conditions and to end-use requirements. High-quality concrete. Characteristics such as strength, slump, curing time and resistance to freezing are important considerations in many slab construction projects. The concrete supplier achieves specific batch requirements by varying the ratio of mix ingredients and utilizing different additives. But this only happens when there’s good communication between the contractor and the concrete supplier. Excellent craftsmanship. From excavation and form construction, to placement, finishing and final site cleanup, it makes a huge difference when skilled people are doing the work. At Bowman Masonry & Waterproofing, we take pride in the high level of craftsmanship that goes into every job. To make sure you get the top-notch results you expect with your next slab construction project, contact the concrete repair experts at Bowman Masonry & Waterproofing. Our experienced technicians will evaluate your site, go over your plans and provide a free estimate to complete the project from start to finish. 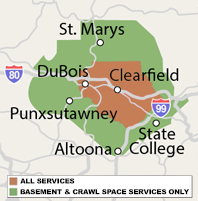 Our services are available in Altoona, State College, Bellefonte, Du Bois, Saint Marys, Pennsylvania Furnace, Brockway, Port Matilda, Tyrone, Ridgway, Kersey and nearby.